After learning all about hair art and how it was used to celebrate weddings, births, graduations and eventually burials, I found myself venturing down the path of mourning jewelry. The culture of mourning jewelry goes way back. And only seemed to fade from fashion with the invention of photography. 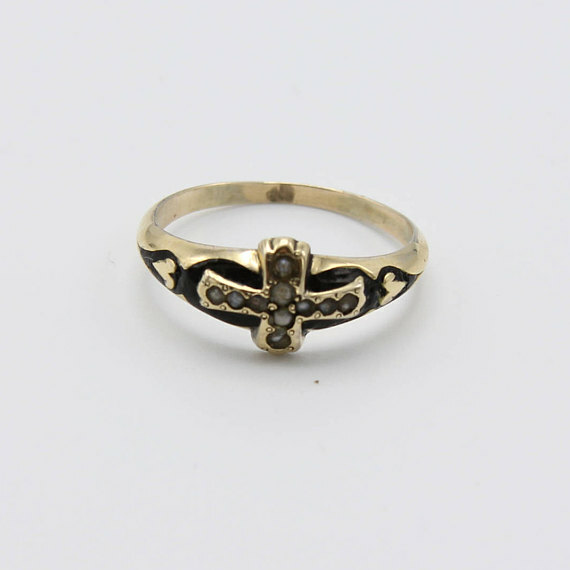 The sentiment behind a ring was as much for the living as it was to remember the dead. “Remember you must die” was commonly quoted when these pieces of jewelry were passed out at the funerals. 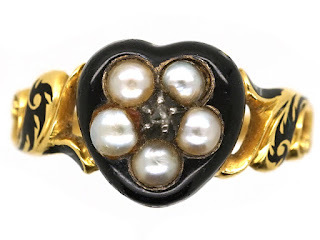 These rings were usually made with black enamel, but if they had pearls interwoven in the design, than they represented the loss of a child. If the ring was made with white enamel, then the deceased was probably a woman and a virgin. If the ring had a diamond, then it was a sure sign the family was wealthy. Hair was often incorporated into the art. If it wasn’t placed directly into the ring, then the hair was often pulverized and mixed into the paint. Men also wore these touchstones of their grief in decorated cuff links and watch fobs with their beloved’s hair woven in. Most are beautiful, and the sense of deep loss can be felt even now, hundreds of years later. 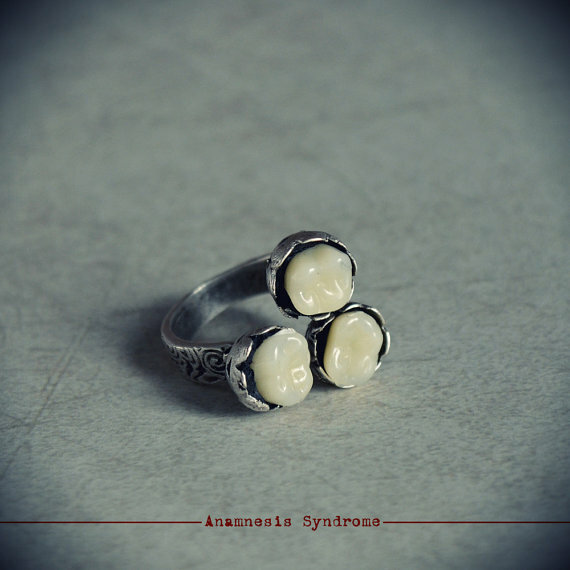 I found several samples of modern day mourning jewelry on Etsy, as well as some vintage pieces for sale, including these that are made of a lost loved ones teeth. And then I had to check out what the fad changed to with the onset of photos. 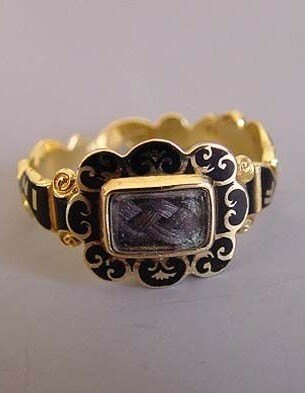 I would most definitely prefer the mourning jewelry to the more shocking death photography. I only posted one of the death photographs because the picture made the loss too real and too personal for me. But if you want to see more, here is a link to a BBC article about death photography. I also found that there are services out there now for death photography. Would you ever consider having a piece of mourning jewelry made? Do you find the tokens are more beautiful then macabre? Have you ever had a piece of mourning jewelry made? Would you ever consider death photography? Hopefully I didn't shock you too much. If you'd like to know more about me and what I'm up to then you can see the bio details below. I started a podcast. If you are a podcast listener and you need a dose of joy-meets-common sense, come on over to Life Caraphrased. Cara Grandle is a Historical Romance Novelist who prefers to write about the early settlers of the Pacific Northwest. Think trappers and loggers and scroungy-backed woodsmen. She is represented by the Steve Laube Agency. 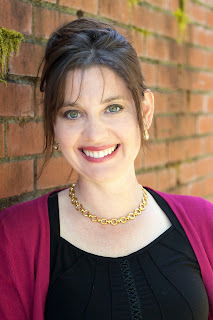 Cara leads the author4TheAuthor writers group on Facebook, home to 190 writers. Together they're pressing back on busy and making a space for their dreams. Cara is currently out on submission. Follow her journey on her Facebook author page. Prayers much appreciated. I've also seen pictures with hair pieces incorporated into the design. I knew about using hair in mourning jewelry, but the teeth go way too for me. It reminds me of jewelry and other pieces made by the Nazis from murdered Jews. Me too. Not in the beautiful category for me. Shudder. But grief is grief. As a genealogist, I have studied these topics, along with cemeteries, and find it all fascinating. 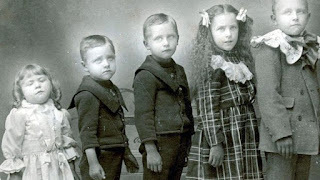 I have several old death photographs of family members in my collection and also pieces of hair from some of the children who died long ago. Sometimes people find it comforting to do this. When my mother died, I cut some of her hair to keep. I agree. Grief is individual. Cool and creepy! Love interesting tidbits of history- great article. I actually have a couple pictures of babies who are dead, that I found in my mom's & dad's possessions after they were gone. So I wasn't too surprised. I have also seen the creations from people's hair after their death. Some are fascinating because they are so intricate. Teeth I really can't stand to see, but I know moms who kept their children's teeth. Interesting blog post! I've seen death photos and decorative pictures made from a dead person's hair, but I've never heard about mourning jewelry before. Do you know what time periods it was most popular? You’ll want to check me on this, but Regency and Victorian era is what I seemed to see the most photos of. Until photography came on the scene. The ring of teeth is a little too much, even for me. :) We have a funeral museum here in Houston and it's an interesting place to visit. They have scenes with mannequins depicting families in mourning to show the clothes and jewelry of the time. They have a wonderful display of mourning jewelry. I actually took a "death picture" of my mother. The last time she visited my brother while he was in prison, he barely recognized because of her ravages of cancer. With her favorite pink suit and jewelry and her platinum blond wig, the funeral home did a wonderful job and she actually looked like her real self, so I took a picture and gave it to my brother so he could remember her by the beautiful woman she was. He then painted a portrait of her using that picture as a guide, and it's a beautiful smiling painting of the woman we all loved. Thanks for a great look at a fascinating subject. That is interesting. I’m so glad your family has that memorial. And I’m sorry you lost your mom. Cara, this was a very interesting post. I recently read about that (Victorian) death photography. Some of the images were disturbing and explained why in some old photos the eyes look so strange since they were sometimes painted in. I can understand mourning jewelry as a quiet statement of grief and a memorial. Have to say that even as a former dental assistant the ring with teeth was a bit much! ;) I guess grief is very individual.